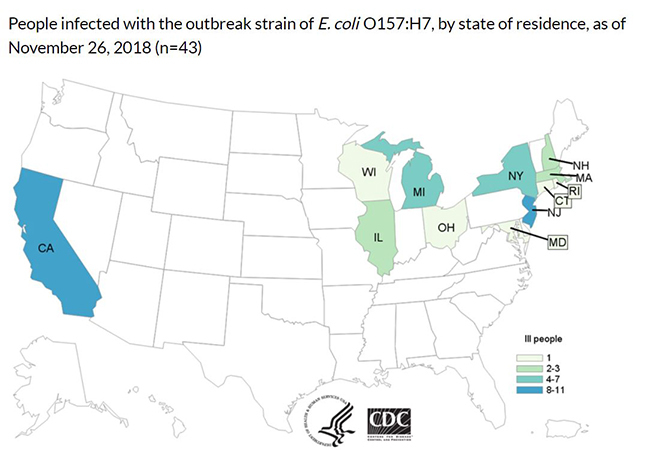 The U.S. Food and Drug Administration, along with the Centers for Disease Control and Prevention and state authorities, continues to investigate a multistate outbreak of E. coli infections associated with consumption of romaine lettuce in the U.S.
As of November 26, 2018, this outbreak has resulted in 43 people becoming ill in 12 states, with the last reported illness onset date being October 31, 2018. An additional 22 people in Canada have become ill, and the FDA and their partners are also coordinating the investigation with Canadian health and food safety authorities. As the investigation of this outbreak continues, the FDA announced new steps to help consumers better identify where their romaine is grown through voluntary labeling. To prevent additional cases of E. coli, the CDC advised the public not to consume romaine lettuce and to destroy any romaine lettuce in their homes. At the same time, the FDA requested that all romaine lettuce on the market, including in restaurants and other commercial establishments, should be withdrawn and destroyed. The FDA made this request because initial information available at that time had not identified a likely source for the outbreak that would allow a targeted request, it was likely romaine lettuce contaminated with E. coli that could cause illness was still available on the market, and a market withdrawal was the fastest way to remove potentially contaminated product. Where is the lettuce coming from? Based on further discussions with the leafy greens industry and with agricultural authorities, they have begun to narrow the location in which they believe the contaminated romaine in the current outbreak was grown. At the time of the outbreak, the vast majority of the romaine on the market was being grown in the Central Coast region of California. Since, then harvesting of romaine lettuce from this region has ended for the year. Growing and harvesting of romaine lettuce is now shifting to the winter growing regions of the U.S., which include mainly the California desert region of the Imperial Valley, the desert region of Arizona in and around Yuma, and Florida. What about lettuce coming from other areas? Romaine lettuce grown in Mexico is exported to the U.S. during the winter months. Smaller quantities of romaine lettuce are grown in other states. At this time, the FDA has no information to suggest any of these growing areas are involved in the current outbreak, which began well before any romaine lettuce from these winter growing locations was available for harvest. Based on discussions with major producers and distributors, romaine lettuce entering the market will now be labeled with a harvest location and a harvest date. Romaine lettuce entering the market can also be labeled as being hydroponically or greenhouse grown. If it does not have this information, you should not eat or use it. If consumers, retailers, and food service facilities are unable to identify that romaine lettuce products are not affected – which means determining that the products were grown outside the California regions that appear to be implicated in the current outbreak investigation – The FDA urges that these products not be purchased, or if purchased, be discarded or returned to the place of purchase. 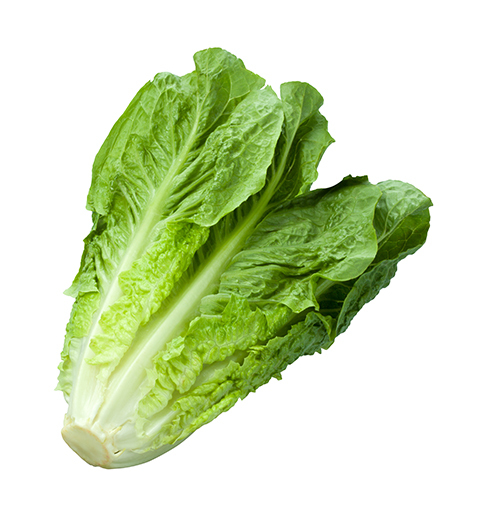 If you do not know where your romaine lettuce was harvested, do not eat it and throw it away. This advice includes all types or uses of romaine lettuce, such as whole heads of romaine, hearts of romaine, and bags and boxes of precut lettuce and salad mixes that contain romaine, including baby romaine, spring mix, and Caesar salad. Report your illness to the health department. Assist public health investigators by answering questions about your illness. New 2015 U.S. Dietary Guidelines …Here We Go Again Grab a Handful of Popcorn for Healthier Snack Blueberries Kick Off Magnificient 7 SuperFoods Series Unique Excursions: Visit Farmers Markets of the World – Spain to Seattle Have You Seen the Latest Issue of Healthy Aging® Magazine?